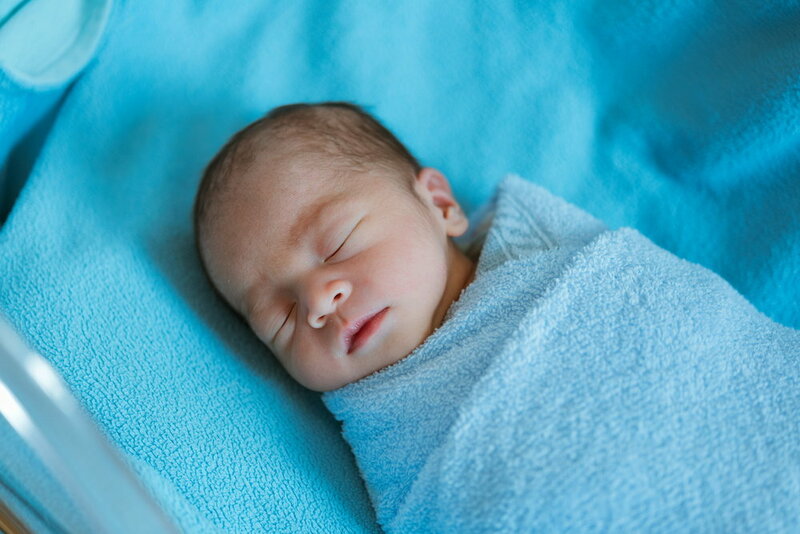 It is not uncommon for parents to have questions about newborn sleep behaviors and safety. Most of them are concerned about doing everything that they can to prevent Sudden Infant Death Syndrome (SIDS), suffocation, or positional asphyxia. Many practical steps can be taken to help protect your child against those conditions, but today we are focusing on the ABC’s of safe sleep. The ABC’s are based on tips for safe sleeping recommended by the American Academy of Pediatrics and provides a simple acrostic for three important components of keeping your child safe while they sleep. It is an excellent idea to allow your newborn to sleep in the same room with you because it helps to ensure you will hear them when they wake up during the night. Additionally, it is considerably easier to manage middle of the night feedings when your baby is right there with you. However, the A in the ABC’s of safe sleep stands for Alone which means that while your child can sleep in the same room with you, the safest place for them is not to be sleeping in the bed with you. Along with sleeping alone, your baby’s sleep area should be free from items such as bumpers, loose bedding, and toys because these all substantially increase your child’s risk of suffocation or entrapment. The B in the safe sleep ABC’s stands for Back because, for your infant, sleeping on their back is the safest position for them. It is perfectly okay to allow your child to play on their stomach during awake times (in fact tummy time is greatly encouraged) but until your baby can roll over unassisted and appropriately position their head while on their belly, suffocation is a serious risk. Tummy time during the day can help your child develop their core muscles and head strength so that when they begin rolling over on their own, they can maintain safe positioning. The final letter in the acrostic is Crib which encompasses the specifications of your child’s sleep environment. Newborns should only be allowed to sleep in a crib or bassinet that meets current safety standards. The sleep surface in the crib should be firm as a soft mattress can potentially pose a hazard should your baby roll over in the middle of the night. Similarly, if their head sinks into the mattress material (even when on their back), it could restrict their ability to breathe. It is also advised to avoid sleep positioning devices because their effectiveness is inconclusive and in some cases, they can be a threat to your child’s health should they roll out of the apparatus. Last week, we discussed the importance of baby sleep on their growth and brain development but what about their parents? Most parents are aware that having a newborn in the house means long nights and very little sleep. There are many different approaches that parents take to getting the sleep that they need to function each day. Whether it is sleep when the baby sleeps, taking shifts at night, or even trading off nights, each couple is different, but the common denominator is that all parents need sleep. But why? Let’s explore the importance of new parent sleep. Most of us know that lack of sleep can contribute to a lack of focus, concentration, and sharpness in our day to day lives. The lack of these qualities often leads to errors in judgment or silly mishaps that wouldn’t have happened had we gotten a full night’s sleep. The lack of new parent sleep, however, can lead to moodiness, irritability, and even some very dangerous situations for your baby. It is not uncommon for sleep-deprived parents to doze off with their kid in their arms during a feeding or to be tempted to bring their baby into the bed with them. Thankfully most parents escape these minor incidences unscathed, but you certainly don’t want to put your child at risk of being dropped or crushed because you aren’t getting enough sleep. Sleep deprivation is a very well known cause of many types of depression including postpartum depression. Unfortunately, the lack of new parent sleep can deepen or worsen existing depression which can prolong poor sleep patterns leading to a vicious cycle of worsening depression. While it can be difficult to identify postpartum depression in the early stages, once it is identified, getting adequate sleep plays a vital role in your recovery. This article from the Huffington Post discusses the role sleep plays in postpartum depression. Our bodies require a good deal of sleep to recover from injury or illness and recovering from delivery is no different. Many women need 4-6 weeks for their body to get back to normal after delivering a baby. If there was any tearing, scarring, or if you delivered via c-section, you will likely need longer than that to feel like yourself again. A lack of sleep slows this healing process dramatically not to mention increasing the likelihood of re-injuring your tear or stitches. Are you and your partner concerned about a lack of new parent sleep? Our team would love to work with you to help you get the rest you need so contact us today. It's not uncommon for newborn babies to sleep the day away, only staying awake for short periods. In fact, infants generally sleep between 16-18 hours in a 24 hour period. If you have or are expecting a baby who was born prematurely, it is likely they will sleep even more than a full term newborn. In today's blog, we are going over why this much baby sleep is critical for brain development. When your child doesn’t get the sleep they need, there are many potential consequences that both parents and baby have to deal with as a result. One condition that can result is simply called being overtired. When a baby is overtired, they will exhibit a high degree of fussiness that may be highlighted by crying, screaming, and flailing. Unfortunately, the state of being overtired makes it more difficult for you to put your child to sleep rather than making it easier. For this reason, it is ill-advised to allow your child to become overtired in the evening and night hours. Baby sleep deprivation when your child is a little bit older can manifest itself as a lack of concentration. Since this lack of focus will only get worse as your child gets older, it is advisable to ensure they are getting enough sleep during these formative years. There are two basic types of sleep for human sleep cycles known as REM and non-REM sleep. REM sleep stands for rapid eye movement sleep and is defined as the light portion of the sleep cycle where the eyes move back and forth rapidly. This type of sleep gives rise to dreaming but is also when we are most likely to be awakened. Non-REM sleep is sometimes referred to as deep sleep and is the restorative portion of the sleep cycle where brain development and repair take place. It is crucial that your child spends enough time in this type of sleep to ensure proper development of brain function. Two of the main differences between baby and adult sleep cycles are the duration of each type of sleep and the overall length of the sleep cycle. You may already know that sleep promotes growth but here are some other benefits to baby sleep you might not know. Sound sleep can protect kids from vascular damage from stress hormones that can be released as a result of brain arousal during sleep. Sleep also produces proteins that help fight infection, illness, and stress which helps your child remain healthy and happy. However, one of the best reasons to make your baby’s sleep a priority is the fact that babies learn in their sleep. Research performed at the Columbia University Medical Center has shown this to be true in babies as young as one or two days old. Want to make sure your child gets off on the right foot with their sleep habits? Contact us today about hiring one of our newborn care specialists to work with you and your little one on sleep training. [et_pb_section admin_label="section"][et_pb_row admin_label="row"][et_pb_column type="4_4"][et_pb_text admin_label="Text" background_layout="light" text_orientation="left" use_border_color="off" border_color="#ffffff" border_style="solid"] One of the biggest mistakes parents make is not having faith in their babies abilities to do things. Yes, babies do need assistance with a lot of things but you might be amazed at what they are actually capable of! In today's blog we are talking about infant self soothing and sleep plans! Yes, your baby is capable of self soothing! It may take some time and it may take some teaching but your baby is totally capable of self soothing in most cases. Of course there are exceptions such as when baby is sick or had a rough day and there are times when they might need a little extra cuddling and that is totally fine! However, if given the opportunity, most babies can learn to put themselves back to sleep when they wake at night (unless it's time to eat) and can manage a couple minutes on their own. Babies cry to communicate. It doesn't necessarily mean they are sad or upset. A crying baby is trying to tell you something and it's your job to figure it out. No, you don't have to pick up your baby immediately every time they cry. Usually it means "I'm hungry, I'm tired, I need a diaper change or a change of scenery." And sometimes it means they just want to be held. It is okay to let your baby cry for a minute, in fact, sometimes they just need to be heard and then they are content. You can talk to your baby and let them know you are there and that you will tend to them in a minute. Perhaps you are busy feeding an older child, cleaning up a mess or maybe just going to the bathroom yourself. It's ok to let the baby cry for a minute while you finish your task. Your baby is going to be fine! Short spurts of crying will not harm your baby, in fact, it may empower them to learn to self soothing and learn patience and independence. Yes, your baby can sleep through the night by around 4 months old. Most babies will naturally sleep through the night with minimal to no crying by 3-4 months old….if you give them the opportunity and tools to do so. Your baby of course needs to be healthy, gaining weight and eating enough throughout the day. Your baby also needs to be taking appropriate naps during the day because daytime sleep does affect nighttime sleep. *If your baby was born early, is not gaining weight adequately or has any other medical issues please ask your pediatrician before starting any sleep plan so he or she can can advise you what is safe and appropriate for your particular baby. If you are unsure where to start consider reading a sleep book such as 12 hours sleep by 12 weeks or hiring a postpartum doula or newborn care specialist that can put together and help implement a sleep plan for you. You do need a plan but a baby can sleep through the night whether you are doing attachment parenting, scheduled parenting or a combination of both. Have faith in your baby and start off with good sleep habits from day one!